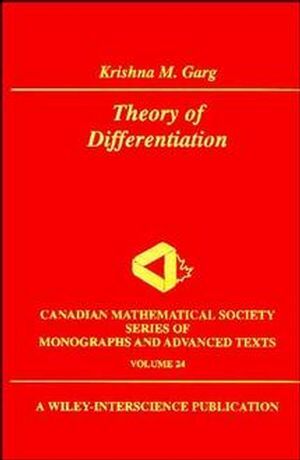 Theory of differentiation includes all aspects of various kinds of derivates and derivatives, and the theory of various Perron and Denjoy-Perron integrals. Derivative theorems covered are theorems on unilateral (or Dini) derivates. Through a cohesive format, outstanding problems are resolved, new ones are presented, and developments in this field, both past and present, are covered. Krishna M. Garg is the author of Theory of Differentiation: A Unified Theory of Differentiation Via New Derivate Theorems and New Derivatives, published by Wiley. A UNIFIED THEORY OF UNILATERIAL DERIVATES. Definitions, Notations, and Preliminary Results. Some Fundamental Theorems on Unilateral Derivates. A THEORY OF SOME NEW DERIVATIVES. THEORY OF NEW DERIVATIVES (CONTINUED). Monotonicity and Other Properties in Terms of New Derivatives. Properties of New Derivatives and New Derivability Sets. Denjoy and Perron Integrals Corresponding to New Derivatives. SOME DIRECT APPLICATIONS OF THE THEORY OF NEW DERIVATIVES. Derivates and Derivability of Symmetric, Quasismooth and Smooth Functions. Strong Derivates and Strong Derivative. UNIFIED AXIOMATIC THEORIES OF GENERALIZED DERIVATIVES. A Unified Theory of Generalized Derivatives. A Unified Theory of Generalized New Derivatives.